Tucked away between George Street and Richmond Green you will find the pedestrianised Brewers Lane, Richmond's High Street during the reign of Elizabeth I. Mo and Khamis have been selling gifts and jewellery from Moon & Star at No 3 for the last ten years. 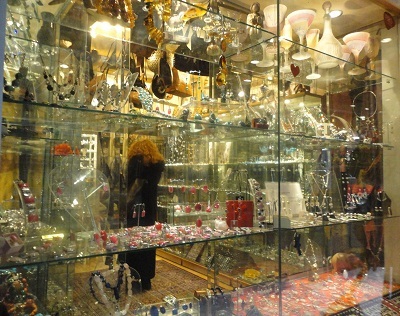 It's hard to resist the window display of jewellery and gemstones; once inside you will think you've arrived in Aladdin's cave. 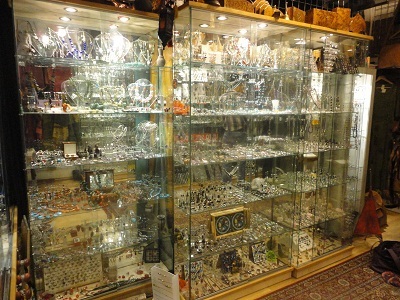 Illuminated glass showcases are crammed full with silver and filigree jewellery: rings, necklaces, earrings and bracelets set with gemstones. All the jewellery is hand-made, much of the beadwork created by Mo, and the gemstones are sourced from India and Morocco. If you have a favourite stone, are looking for an item containing your birth stone, or perhaps searching for a particular stone for its healing properties Moon and Star have a wide selection ranging from lapis lazuli, turquoise, amber, quartz, garnets, amethysts… I think you've probably got an idea by now. In addition to the jewellery you can also find a selection of bags, scarves, ceramics and carved wooden figures, as well as drinking glasses that are crafted in Jerusalem in the same styles that were created by the Romans two thousand years ago. Just in case you have trouble locating the shop, just follow the smell of incense that will probably be burning outside. I'm sure you'll get a warm and helpful welcome once you step through the door. And with Mothers' Day approaching, Moon & Star is the perfect place to buy a gift.